In the midst of your day, you’ve likely noticed a project or two that needs tackling, such as putting fresh paint on your exterior or trimming those overgrown shrubs in the front yard. While these projects may be obvious, are there home maintenance tasks you might be overlooking? 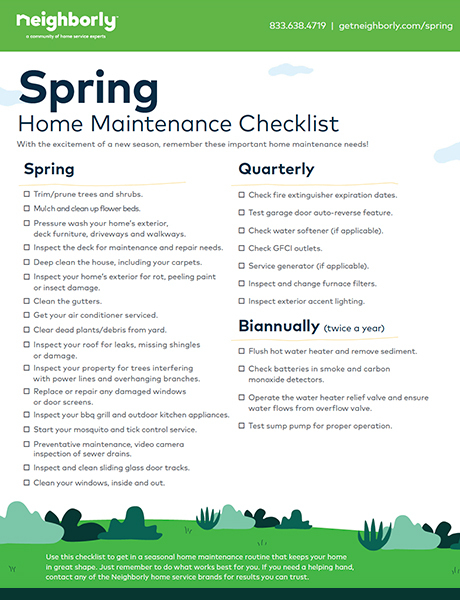 Take the guesswork out of preparing for spring with your own comprehensive Spring Home Maintenance Checklist, courtesy of Neighborly®. This resource will help ensure your home is in its best shape and that you’re ready for your first backyard barbecue of the season. And better yet… your checklist is FREE! Inspect your home’s exterior for rot, peeling paint or insect damage. Replace or repair any damaged windows or door screens. Start your mosquito and tick control service. Inspect your BBQ grill and other outdoor kitchen appliances. Click to download the complete checklist! Do you need assistance with any of the home maintenance items on your list? We’re here to help. Visit our home page to explore our services and connect with a local Neighborly pro.